"Myth #7: Received the Great Controversy in Vision"
"Top 7 Myths: #7: Received the Great Controversy in Vision"
As the story goes, on March 14, 1858, Ellen White had her famous Lovett's Grove vision about "The Great Controversy". 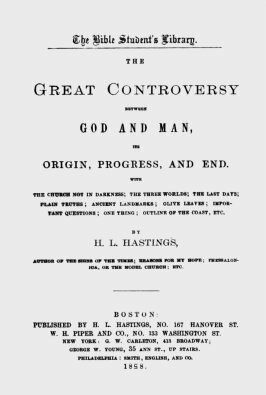 Interestingly enough, a mere four days later, on March 18, 1858, a review of Hastings' Great Controversy appeared in James White's Review magazine! In order to appear in the March 18 issues [sic.] of the Review, the book had to have been purchased and read earlier in the year. It quickly becomes obvious the Whites were familiar with Hasting's book prior to Mrs. White's vision. . . . In the review of Hastings' Great Controversy that appeared in the Review article the author (most likely James White, but possibly Uriah Smith) . . . . This charge appeared quite promising, but unfortunately, someone forgot to read closely the title of Hastings' book. According to the picture of the cover as found on Dirk's site, which we post here for your examination, the title can be clearly seen as reading: The Great Controversy Between God and Man. In contrast, Mrs. White's book is entitled, The Great Controversy Between Christ and His Angels, and Satan and His Angels. If you're trying to convince an Adventist that he's wrong, this difference is anything but slight. When Adventists speak of the "Great Controversy" theme, they are talking about a war between Christ and Satan, a war that Satan started because he was jealous of Christ's position and authority as the Son of God in heaven. This theme can be found in much of Mrs. White's writings, as is evident in the title chosen for her book. But Hastings' "Controversy" is between God and man, not between Christ and Satan. We decided to peruse the writings of other Christians to see how popular the phrase "great controversy" has been. Our quick search resulted in 19 references from 14 authors, including Augustine, Melancthon, Arminius, Flavel, Matthew Henry, John Wesley, and Albert Barnes. See the entire list of quotes and references here. Whenever considering the question of plagiarism, especially when the charge relies on the similarity of but a few words, one must consider the possibility that both sources were merely using phrasing common in society at that time. In such cases, by today's standards, no credit need be given. In all the above references we found, not one referred to a "great controversy" between Christ and Satan. Thus far it appears that this specific theme was unique to Mrs. White. As Dirk appears to know, Uriah Smith was the editor of the Review at this point, not James White. It is therefore fairly certain that Uriah, not James, wrote the unsigned book review in question. And that being so, one must simply ask the question, Was James White in town when the book arrived at the Review office? According to the picture of the cover as found on Dirk's site, Hastings' book bears the date of 1858. The window of opportunity for James to see this book prior to March 14, the date of the vision, is therefore small. IT is our design to be at the Conference at Green Spring the 26th, and to meet in Conference with the brethren at Gilboa, March 6th and 7th. We may spend three or four weeks in Ohio. JAMES WHITE. We'll assume that he was in Battle Creek when he submitted this notice for publication, though that was not always the case when such notices were published. When in January? Who knows. But the point is that Hastings' did not complete his book until sometime in January, after which it was printed, after which it was bound, after which it was shipped from Rochester, NY, to Battle Creek, MI. Now if it reached Battle Creek before that last week of February, when James White departed for Green Springs, OH, and if Uriah Smith showed it to him, then this allegation would have some possibility of being true. But with such big "if's," this charge could never stand up in a court of law as is. More evidence is necessary before a condemnation can be rendered. When was the book completed in Rochester? When did the book arrive at Battle Creek? Did anyone travel with the book from Battle Creek to Ohio while the Whites were in Ohio? Did anyone in Ohio already have the book, and show it to James there? Just about the only thing we know for certain at this point is that Uriah did not call James on his cell phone to tell him all about Hastings' book. We look forward to the opportunity to see solid evidence that James White saw this book prior to his departure the last week of February, or saw it at any time prior to March 14. Hopefully we will not have to wait too long to receive such evidence from the presumed author of the web page in question. Imagine our surprise to not find one example of plagiarism out of the 22 comparisons Dirk then presents. True, both books said that Christ was "blindfolded" at His humiliation, and that people said to Him, "Hail, King of the Jews." Yet all this shows is that both Hastings and Mrs. White were incorporating into their books actual wording found in the Holy Scriptures. Such is definitely not plagiarism. Many of the alleged similarities in thought appear to result from the fact that both books are commenting on various Bible stories. Any book covering the major stories of the Bible will appear similar in topics and order of topics to any other book that covers the same ground, even though neither author has heard of the other's work. The books are very similar, but a careful comparison does not support the idea that Ellen White's book is based on Hastings'. The book may have stimulated her thinking, and suggested many ideas, but she did not have it open before her when she wrote her volume: she emphasizes some points he ignores and presents detail not found in his book. Moved with this "fear" he seeks to escape. . . . he "prepared an ark for the saving of himself and house." All this shows is that both Hastings and Mrs. White were quoting from Genesis 6:11 and Heb. 11:7. In fact, since Mrs. White followed these verses more closely than Hastings, we can know with certianty that she got her words from Scripture, not Hastings, in these two examples. Hastings' book had a different focus than Mrs. White's Great Controversy vision. Thus far it is entirely speculative to say that James White saw Hastings' book prior to March 14, 1858. Even the very authorities that the critics cite admit that Ellen White did not base her book on Hastings' book. There seem to be some confusion among those critical of Mrs. White as to what is plagiarism and what is not. It would be well for them to thoroughly research the topic, for it sounds rather peculiar to suggest that Mrs. White plagiarized simply because she quoted the same Scriptures someone else used when commenting on the same Bible stories. Moreover, it is commonly known that Matthew, Mark, and Luke are quite similar in wording and topics. Is Dirk suggesting that Luke was a fraud simply because he used the words of Matthew when writing down the divine thoughts God gave him? There are indeed people out there who would say such. How then can Dirk consistently uphold the authority of God's Holy Word without demolishing it with the same weapons that he uses to destroy Ellen White? We feel that Dirk's readership deserves to know up front his position on the authority of Scripture, and how he avoids destroying it along with Ellen White. Did Hastings' book "inspire" Mrs. White's vision? I haven't seen any evidence yet that Ellen's vision was inspired by Hastings' book. The focus of the two books was different. Didn't you hear? Smith emailed James a PDF copy of Hastings book while James was in Ohio. And James called him about it on his cell phone. I think you shouldn't ask so many questions. Just believe what these guys are saying, and don't analyze so much. If Ellen White or any of the Bible writers ever once used the words of others without giving credit, that would prove for sure that they were all a bunch of frauds.